Eagerly awaited by many genre fans, The Exterminator finally hits Blu Ray (in a combo BD/DVD 2 disc set) from Synapse Films on September 13th. This little horror/exploitation/revenge film has a huge cult following and (with its unforgettable cover art) was a staple in the classic days of VHS. I'm sure many folks remember seeing this in your local mom and pop video stores back in the 80s. I sure do. Amazingly, I had never seen the film before and held off after hearing about this exciting new release. The Exterminator takes place in the slums of NYC where two ex-vietnam buddies, John (Robert Ginty) and Michael (Steve James) get in a fight with a local gang. After winning the fight, they come back and get revenge by crippling Michael. This enrages John so much that he snaps and goes on a rampage to try to wipe out not only the gang that crippled his friend but also the kingpins who are responsible for the dangerous city streets. John, being a trained fighter and weapons expert makes these criminals pay for the wrongs that they've done. The Exterminator is a Grade A revenge film that not only has lots of action, but also some interesting characters and some great Gore FX. Check out the first 5 minutes of the film and you'll know what I'm talking about. The characters, especially John the lead, are well developed and much more human than you would expect from a film like this. Robert Ginty does a great job as John and it's fun seeing genre vets Christopher George (City of the Living Dead) and Samantha Eggar (The Brood) trying to figure out the Exterminator's identity. Synapse's new release is the Unrated Director's Cut, featuring more gore and violence as well as a director's commentary and (for the first time in the US on home video) the original 2.0 stereo track. I'd rank this one right up there with Death Wish and Vigilante as one of the most violent and brutal action/revenge film. I can't really think of any flaws in this film. The film kept me interested and really delivered everything I was hoping for (and then some!). Now....where's Exterminator 2 on DVD or Blu Ray? 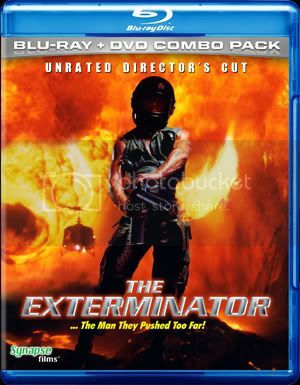 Pre Order The Exterminator DVD/BD 2 disc set HERE from Synapse Films.